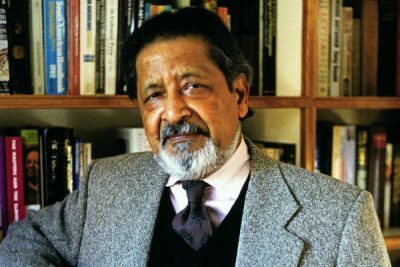 V. S. Naipaul, the Nobel winning author who just died, was, like so many people, an enigma, at least in his writing. Lauded for his prose style and exquisite way with words, he was seriously criticized for his demeaning of Islam, women, Africans, and others in post-colonial countries, including the Caribbean from whence he came. Such criticism was amply justified. He seems also to have been bigoted and irascible personally, while charming when he wished. A strange character, many of whose political and cultural views I find abhorrent. This is true for Naipaul. He once said that fiction never lies, and while this may or may not be true, it is true that writers whose politics one may find repulsive can also, despite their conscious intentions, write books that glow with an extraordinary prose luminescence that mesmerizes and reveals deep insights. This is the case with Naipaul’s The Enigma of Arrival, a work he calls a novel but that reads like an autobiography. While his novel, A House for Mr Biswas, is considered his finest work and the book that made him famous, I think The Enigma of Arrival is a masterpiece. Deeply melancholic, it allows Naipaul’s shadow side to reveal truths that go far beyond the man himself. The prototype for all journeys is life itself. This being so, it follows that every destination prefigures death and of necessity poses an enigma. For although one travels in part to arrive, at the same time one’s anticipation of arrival harbors the fear of cessation. It is because every elsewhere contains the worm of death that some people never embark on the voyage, while others go from “place” to “place” in search of paradise. Outwardly at least, the story Naipaul tells in The Enigma of Arrival is impersonal, slow-paced and almost boring in its progression (much like ordinary life). After twenty years in England – “savorless and much of it mean” – having failed in his effort to leave England with its history of colonial exploitation and become “a free man,” his spirit broken and his nerves shattered, he settles in a “cottage of a half-neglected estate, an estate full of reminders of its Edwardian past” on the Salisbury Plain near Stonehenge. But where? For at the heart of his pilgrimage is an image from which his book’s title derives. It is a painting by Giorgio de Chirico, “The Enigma of Arrival,” so named by the poet Apollinaire. It is a scene of a wharf; in the background rises the mast of an antique sailing ship; in the foreground stand two figures, muffled and mysterious. In his fascination with this painting, Naipaul imagined a story of a man who arrived at this port, enters the city, has encounters and adventures, but gradually has the feeling that he is getting nowhere. In his lostness and panic, he miraculously finds his way back to the quayside in order to escape. Every generation now was to take us further away from those sanctities. But we remade the world for ourselves; every generation does that, as we found when we came together for the death of this sister and felt the need to honor and remember. It forced us to look on death. It forced me to face the death I had been contemplating at night, in my sleep; it fitted a real grief where melancholy had created a vacancy, as if to prepare me for the moment. It showed me life and man as the mystery, the true religion of men, the grief and the glory. And it brought Naipaul to begin writing this book and to discover in the end that one arrives at oneself or not at all. Whether he did or not, no one can say. Is he still sailing? No one can say? Has he arrived? No one can say. But he left us with this deeply evocative meditation on life and death in the modern world, a world in which, despite science and technology, the old questions remain to haunt us – the enigmas.